I'm not a fan of vulgarity in a game just for the sake of it, so it's rather ironic that this magic weapon holds a special place in my gamer soul. 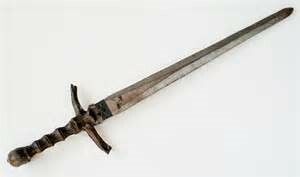 It was originally introduced in the Expedition to Castle Ravenloft campaign I was running for my players some years ago as a plain old +1 longsword. It wasn't even something I added; just a basic magic weapon presented as part of a treasure horde from the book. Now, that group of players wasn't know for getting overly invested with the world in which their characters were busy hacking and slashing through. They tend to lean towards the "if it has hit points we can kill it" mentality. So it was with a great deal of surprise and pleasure as I watched this otherwise vanilla blade come to life over the course of a couple sessions. Sure, they decided there was a constant swarm of flies buzzing about it and the cross guard was actually a pair of spigots that constantly dripped excrement, but they were getting into it! In fact, they were so invested in what they had created that nobody actually wanted their character to be wielding the odorous thing and they eventually they traded it to the local shop keep in exchange for a masterwork mace. All the while, it mechanically remained nothing more than a +1 longsword. To honor that spontaneous and amazing feat of role playing, I decided I needed to provide this memorable weapon with some specific abilities that compliment it's story. So, here it is, updated for the newest edition. This longsword appears to have been poorly maintained through the years. The blade is pitted and tarnished while the metal hilt is dirty and rusted. The noticeable stench of excrement seems to cling to it. No amount of cleaning, magical or otherwise, seems to be able to abolish the longsword’s flaws. Despite the weapon’s depreciated mien, the blade is still razor-sharp. The sword known as Shitstorm spent untold years in the basement laboratory of an evil necromancer, collecting dust until it was discovered by a band of adventurers. Many sages theorize that prolonged exposure to the refuse of magical experimentations may have infused the sword with its current powers. After the adventurers quickly rid themselves of the unsanitary weapon, it found its way into the hands of a city urchin who used it to carve out a name for himself in the back streets of Kaldia. Eventually the urchin drew the attention of the city guard and was eventual hunted down. Shortly afterwards, Shitstorm disappeared back into the dark alleys of the city. You gain a +1 bonus on attack and damage rolls made with this magic weapon. The sword has 3 charges. When you hit a target with this weapon, you can use a bonus action to expend 1 charge in order for the weapon to expel a viscous pool of liquid excrement in a 5-foot radius around the target. Any creature that fails a DC 10 Dexterity saving throw falls prone. Those that fall prone must then make a DC 11 Constitution saving throw or spend their next action retching and reeling. Creatures that don't need to breathe or are immune to poison automatically succeed on this second saving throw. The sword regains 1d3 expended charges daily at dawn. Curse. Once you are attuned to this weapon, you can't end the attunement unless you are targeted by the remove curse spell or similar magic. While attuned, you have disadvantage when attempting any Charisma checks or saving throws. This has to be one of the funniest items I've come across. Well done! I'll have to share this with my DM. Thanks! Let me know if he incorporates it into his game. I'd love to hear how that goes.